Tom and I got engaged 4 years ago, wow! That sounds like a longish amount of time. Sometimes it seems like we've always been together, and then we remember things about our lives before we knew each other and have to tell one another catch-up stories! 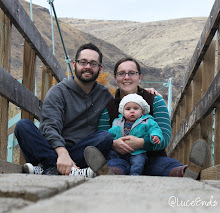 I thought I'd share a few pics from that day and share "our story." Tom had asked me a few weeks prior if I could get the day off. It would be the day after my national EMT exam, and the beginning of his spring break. It was also tax season, and I wasn't sure if I'd manage to get out of a whole day of work, but I did! It also turned out that I had an interview that morning in Redmond, which Tom met me to give me a quick hug before and after. 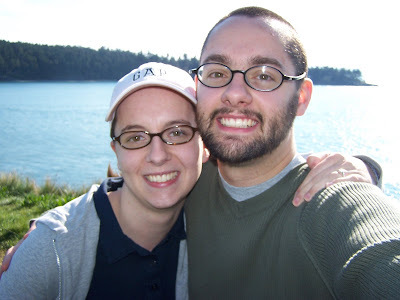 Then we drove up to my parents' house, I swapped clothes, and we headed for Mt. 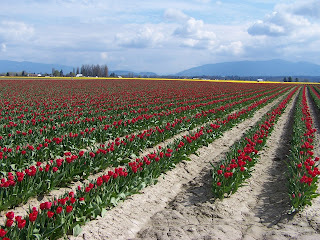 Vernon's tulip fields. Tom had asked me a few days before if there was anything particular I'd like to do that day, and I had mentioned going to see the tulips, however they weren't yet blooming! It turned out they bloomed on the morning of the 24th! 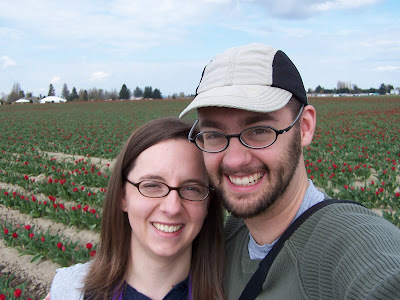 We walked around the tulip fields, saw some daffodils as well, and headed on to Bowman Bay for lunch and some easy hiking around Deception Pass. I had packed tuna sandwiches which we ate in the car facing the bay. We then walked around to see the pass, taking a few pictures along the way. We came around one to one point and Tom said he'd like to take a picture. I continued to enjoy the view while he dug his camera out of his backpack. It seemed to be taking a LOT of time just to pull a camera out, so I turned around and Tom was on his knee with a ring, asking me to marry him! I was sooooooo excited, but super shocked! We had talked about wanting to get married, but with no real time frame. I also knew he wouldn't ask without first talking to my dad, which I didn't think he'd yet done. (It turned out he'd talked with my parents a few weeks earlier!) I was so stunned it took me a moment to answer... YES! We then continued to enjoy the beautiful day, and eventually headed back into Mt. Vernon for Red Robin dinner. We called our parents and headed back to my house to get hugs and show my Mom and Dad my new ring! We had a full evening ahead still. We went to a worship night at Rodrigo and Tina's house, then to dessert after Thursday night college group at Shari's. We surprised some of our friends and upset a few. Oh well, their loss! We were soooo happy (and still are!)! 3 months later we got married!